A manual lens needs to be focused manually; Think again! The Fotodiox Pro PRONTO adapter brings autofocus to your Leica M-mount lenses. If you want to automatically focus your M-mount lenses on your Sony e-mount camera just attach it to the PRONTO adapter. For general use, it is recommended that the lens be set to infinity focus allowing autofocus within the entire focusing range of the lens. Half-press the shutter button to activate AF and the PRONTO adapter will focus your lens just like any other AF lens. Performance is optimal with 50mm and wider lenses. Telephoto optics with require coarse manual focusing before use of the adapter for fine tuning via autofocus. Compatible with the Phase Detection autofocus (PDAF) system on the a7 II, a7R II, a9, a6300, and a6500. This adapter will support both AF-S and AF-C focusing modes, face detection and up to 5-axis stabilization on supported cameras. Decreasing the focus area comes with a significant reduction in speed and may produce some focus hunting. Using any cameras with only Contrast Detection Autofocus (CDAF) is NOT recommended (i.e. Sony NEX, a6000, Sony a7, Sony a7R, Sony a7S, Sony a7Sii, etc). • The PRONTO adapter supports AF-S and AF-C focusing. 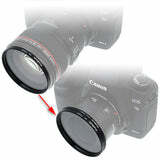 You can change the Focus Area from Wide to Center or Flexible Spot (S/M/L). Decreasing the focus area comes with a significant reduction in speed and may produce some focus hunting. Face detection is also supported. • Please note that the PRONTO adapter has a weight limit of 680g (1.5lbs) for the attached lens. Although this is difficult to exceed with M-mount lenses, it is easy to surpass when using a second adapter on SLR and Medium Format lenses. In house testing and consumer reporting has shown success when supporting the lens instead of the lighter camera.